Take a journey through Silent Wonderland to Looking Mansion, where bells toll to warn of the house's cycles, and lavender doors are the only thing to save you from the Centaur that prowls the halls with fiery eyes and an agenda. Alice Hill arrives at Looking Mansion to support her friend, Buck Glass, while he's on trial for the theft of 6 bullion. Forced to wait outside while Buck testifies, Alice cracks open the doors to watch from the halls. Unfortunately, she's too distracted by the events unfolding in the court room to notice the tolling of the bells. When the shadows start to seep from the walls, Alice knows she must find a safe place to hide or else face the evil that has come to find her. Alice's adventure through the house and surrounding gardens sees her introduced to a motley crew of interesting characters. Unsure of who is friend or foe, she makes her way back, with her dog Rabbit, to the courtroom and the friend that needs her, all while being stalked by the determined centaur. 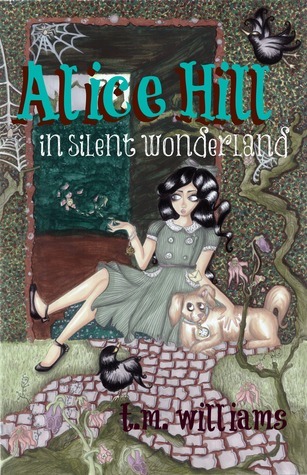 Join Alice Hill in Silent Wonderland as she unravels the mysteries of Looking Mansion. It's been a while since I broke down a book by the good, the bad, and the summary, but I really feel as if that format is going to work best for this book, so let's jump right in, shall we? The Good - Fun story that kept me interested right up to the very end. A lot of short story formatted books reveal too much information too soon, but the author kept everything well paced so that the ending was as much of a delight as the beginning. The Bad - This is advertised as an illustrated story and it just isn't. The pages have a border around them, but it's the same border and I don't honestly consider that illustration. I also felt as if this fit within something else. I didn't really know the characters and that bothered me. If I were the author, I would consider writing more to this and turning it into either a book or a series. The Summary - All in all, a short, enjoyable read. I had some spare time waiting at a restaurant for someone and breezed right through it. I really do hope that the author goes back and writes more to this because I know that I would enjoy reading about this alternative Alice and her world. If you want to know the mysteries of Looking Mansion, I can assure you that this book is worth the $2.99 price on Amazon.